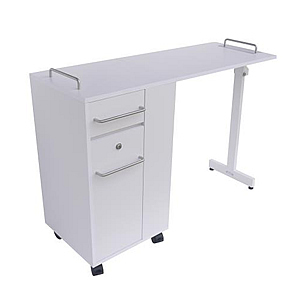 The Chantal is a practical and functional 2-in-one manicure table. It features a foldaway work surface, great for space saving in the salon. 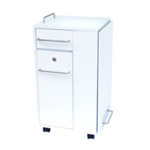 The storage unit is made from a durable white MDF and stands on lockable castors for easy movement. The nail desk features a lockable storage drawer with two shelves as well as a removable drawer which can be used as a table-top display. Dimensions: Height 76cm, Width 107cm, Width when folded 49cm, Depth 45cm.